Hotel Montserrat in Lloret de mar is a very basic hotel situated in the oldest part of Lloret, close to shops, bars and just a 10 minute walk to the beach. As you enter the Montserrat there is a reception desk where the extremely helpful manager has all the local information to help you enjoy your Lloret holiday, he really knows his stuff. 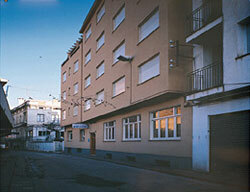 The hotel is old, the rooms are large with basic bathrooms and there aren't any balconies but it is clean with a friendly atmosphere, the location is great, its 'cheap & cheerful'!.